My earlier post about @PokemonGoApp was an adverse reaction to the new gyms. For a lone casual player, playing this Pokemon Go game can be frustrating. No doubt the idea from Niantic is to have players socializing more and team up to take down gyms on a cooperative effort; it is not always the case for everyone. I don’t have friends that have any interest in this game at all except one and if we get together it is not to play this game. One of the core game play is of course battling out rival teams and holding a gym to collect your gold coins rewards. With the coins collected you could exchange it for upgrading your backpack storage, Pokedex storage as well as other goodies including having a change of wardrobe for your trainer! So after mucking around for awhile, I seemed to get the hang of this new gym system. The strategy is almost quite similar with the previous old gym system. In the previous incarnation, you could either knock out the defenders and place your pocket monster or look out for empty slot opportunity; and collect your 10 gold coins as reward. For a lone player, I usually look for gyms that don’t contain more than 3 strong pokemons adversary to have a chance to take down the gyms and most certainly avoid those walls of Blisseys! Now with the new gym system, coin collection is a little trickier because placing any Pokemons do not get you any immediate coin rewards. It needs to stay in the gym for a length, and as of this writing, you get 1 coin for every 10 minutes it stays in the gym and maxing out at 50 coins per day. That’s much more than what I could collect compared against the previous system provided I could hold the gym that long. Basically for a lone player, it is very difficult to take down a fully occupied gym. Even taking down one Pokemon requires several battles if their CP (Combat Points) is high. To take down a full gang of six would take a long time and I don’t have that kind of time to spare! In the end is back to the low hanging fruits strategy, looking out for an opening spot in nearby gyms or taking down weakly occupied gyms. 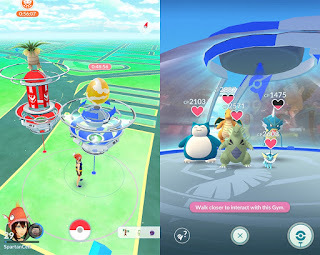 Since the coin collection is based on the duration of your Pokemon occupying a gym; gyms that have quick turnaround where there are many players are not good gyms for placement. With such fast turnaround, I couldn’t even earn a single coin after having fought hard to get a placement. So instead, I decided to try looking out for more isolated, less traffic areas to give my Pokemon a better chance of staying longer. And this strategy has proven to be very productive and I was able to collect up to the 50 coins per day maximum collection! In order to this, you do need to search quite a fair bit of gyms, as empty slots are rather quickly filled up even for the somewhat less traffic areas. That lead me to think that if finding an empty slow is difficult, might be good to set up another secondary account with a different team color and use that to knock out one single Pokemon to make a slot just for yours. You don’t have to battle the entire gang, just concentrate to knock the first one to create a space and place yours. There is a 10 minute waiting time after a battle though. Still kind of a time waster. Anyway, I haven’t decided to do this just yet because to do so requires starting out from scratch for a new team and I’m not that keen to do it. But creating a slot could save time and save car fuel traveling from place to place to find an unoccupied gym slot. So much for walking about for exercise while playing Pokemon Go; the gyms placements are too far apart to walk from one to another. And as for Gym Raid Battles, this usually requires teaming up with friends to take down the Raid Boss. For those who could team up, they get a chance to catch a strong or rare Pokemons. For the lone casual player, will just have to give this a pass as most of the Raid Bosses are just too powerful to be taken down in one round. You only get the first raid pass for free and any additional rounds requires spending 100 coins to get a raid pass. There may be some Raid Bosses that are lower CP, so again if you will need to hunt around for one within your Pokemon’s capability. The new gyms aren’t perfect, not so much an improvement from the previous old gyms, but does introduce some fresh new ideas to keep the players interest up and hopefully a chance for Niantic to earn some real money from players who wants to gain stuffs quickly by buying coins instead of going the slow route of occupying gyms. How people played it is up to them. However the game still need a large mix and pool of active people playing it to keep the interest going. Perhaps one day I may call it quits, but for now, I will still hang on for awhile having played it since 8th August 2016, that’s almost a year now!